Good news keeps rolling in from SANCCOB. 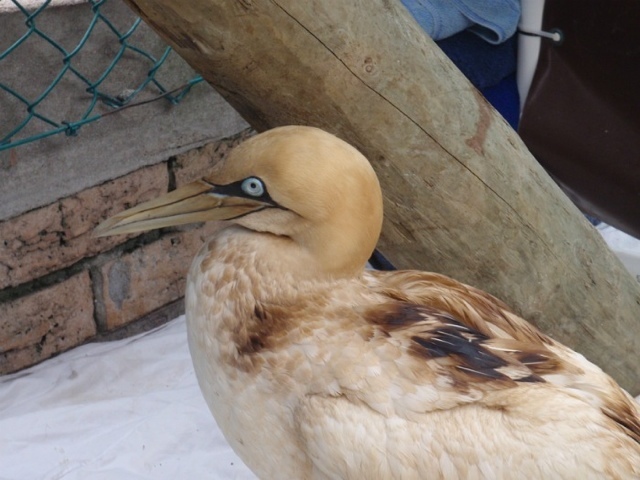 I recently posted that the badly oiled gannet had recovered enough to be washed for the first time. 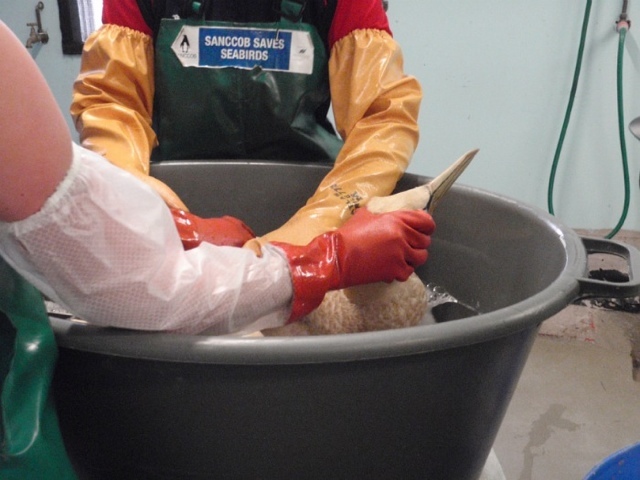 Most of the oil had been removed from his feathers but as the process is stressful, the SANCCOB crew had to leave the rest of the oil for another day. 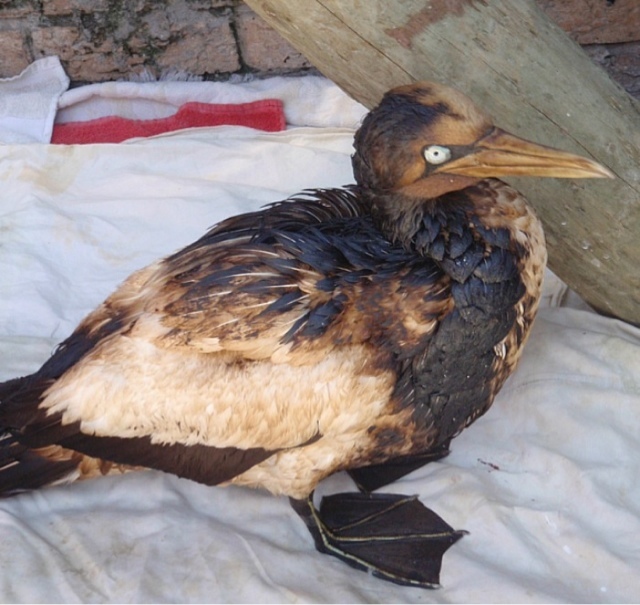 They needed to wait until the gannet regained his strength and then try to remove the rest of the oil. Only few hours after posting that information, I received news that they would be cleaning the gannet again! He had recovered nicely from the first washing and the SANCCOB crew were ready to have another go at the oil. Good news indeed! Everyone sprung into action making sure that the cleaning stations were set up. 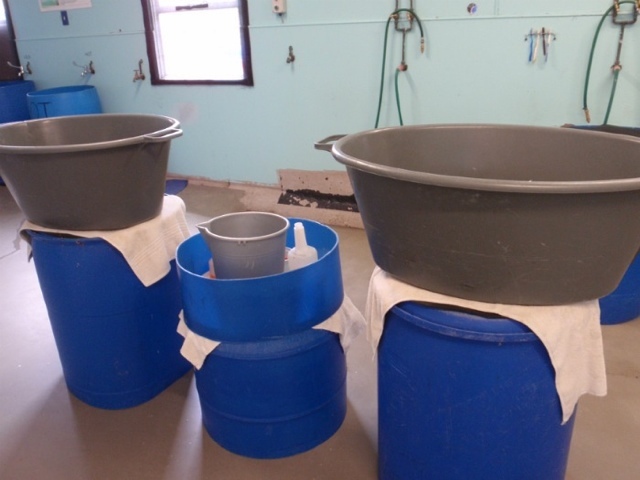 Hot and cold rinsing water, washing tubs and cleaning solutions were organized and they were ready to go. After getting a good grip on the bird (they have extremely long, pointed beaks), the staff lowered the bird down into the warm sudsy water. 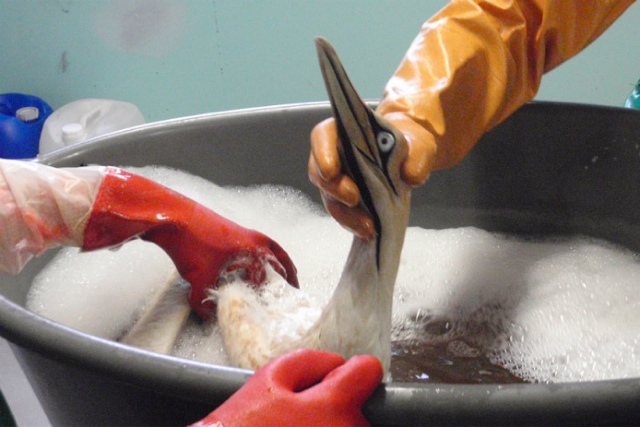 The cleaning solutions that SANCCOB uses is a concoction of different soaps, emulsifiers and canola oil, of all things, to help lift the oil off the bird while being careful not to damage the feathers. The staff even used toothbrushes to get to those delicate areas such as the head. Scrub a dub dub, there's a gannet in the tub! After a couple of washings, the gannet was left to dry out in a separate pen with the help of a nice heat lamp. After a few hours, he was as good as new. Or certainly close to it! Not bad for a bird who was pretty close to death once upon a time. 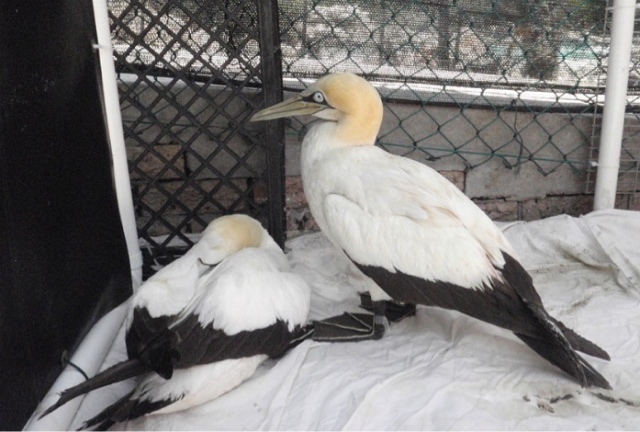 He’s now hanging out with a new gannet that has come into the center and hopefully will make a full recovery over the next few weeks. I won’t be here to see the gannet released but it’s been awesome to see his progress to this point. Another remarkable job by the remarkable people at SANCCOB! After final cleaning-he's the bird standing up! Learn more about the Southern African Foundation for the Conservation of Coastal Birds, or SANCCOB and their Penguin Chick Bolstering Project.